The demolition of the Felnex Trading Estate inevitably required hoardings to be put up for safety. 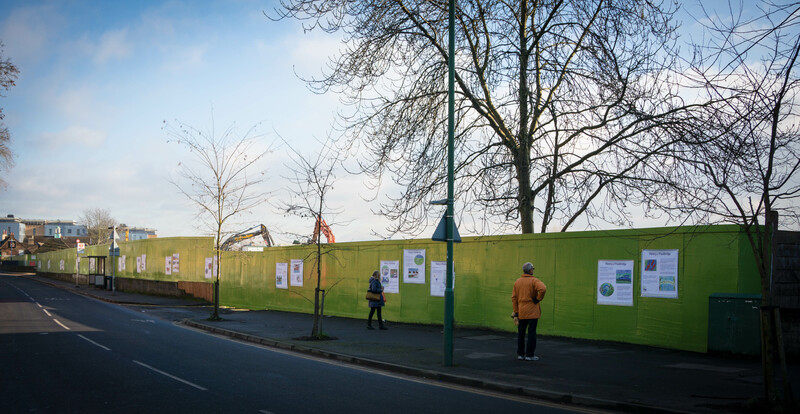 The reality is that these hoardings which now run from London Road into Hackbridge Road will be in place for many years to come. Consultation on our draft neighbourhood plan exposed lots of interesting facts and information about the place we call Hackbridge. The NDG spotted an opportunity here to promote the history of Hackbridge which for many residents comes as a surprise. 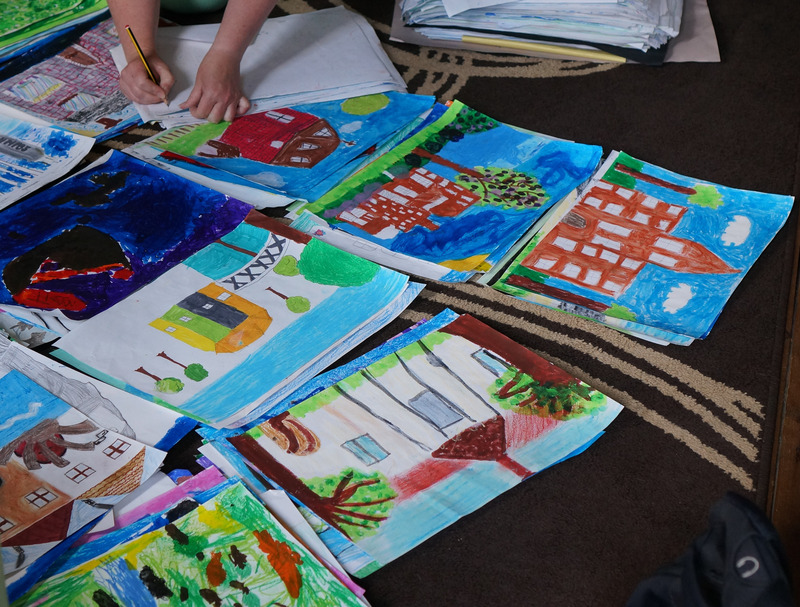 The NDG discussed options with both Hackbridge Primary School and the developers and the idea of producing posters illustrated by children from the school was born. With materials paid for by the developers, every child in Hackbridge Primary had the opportunity to interpret a number of different aspects of photographs and images of Hackbridge. This proved productive in a number of ways including from the perspective of children gaining the understanding of the history of Hackbridge and highlighting the talents of children at the school to undertake such a project. All of the children at Hackbridge Primary from Nursery to Year 6 took part and as a result over 500+ paintings were produced at the end of the school term in 2014. The NDG had the fun and difficult challenge of selecting a set number of paintings. The limit was defined by the space and the topics being covered by the posters. Once the final selection had been made, it was a question of then collating all of this with the relevant text and scanning lots of images to create the actual posters. We then actively sought out a local company, Dakota Printing, to see how we could realise the ideas about how the posters could be best printed out to ensure weather proofing and standing up to wear and tear. Once the hoardings had their final coat of paint, we were able to put the posters up. We were delighted that the ones on Hackbridge Road survived its first test of rain and winds up to 60mph!!!! We hope you enjoy reading these and gaining more knowledge about the place you live in. I saw these posters for the first time today and was greatly impressed with them. I wondered if the images are available electronically or in paper form i.e. a leaflet. I think they would make a lovely book. I want to share some of the images with friends due to the historical content. Please can you advise. I did go to the school but was told to look on this website. We’re glad you like the posters, the children did a lovely job with the paintings and learnt a bit about the history of Hackbridge that we provided them with. We haven’t put these up individually on the website as we are waiting for funding to produce a booklet ourselves. Ever thought of crowdfunding to get the booklets printed? I have contributed to several crowd funding projects and they have always been very successful. Besides the industrial history which I am really interested in, I really liked the fact that Shackleton’s sledge dogs were housed in kennels in Hackbridge as I am involved in several polar charities. I loved the paintings the children did of them. That is a great idea – thank you. It is amazing how much history there is in Hackbridge.